Apologies for the lack of recent news, however the club is still very much active, with well-attended monthly clubnights and our swapmeet twice a year. At the November clubnight Kevin Bailey gave us a well-illustrated talk on the development of Rolls-Royce armoured vehicles, spanning the period from the beginning of the First World War through to the early 1920s. That the cars survived such use and additional weight, even being re-bodied as the design evolved, is testament to the strength of the chassis. Whatever your thoughts on the evils of warfare, it remains a fact that the stress of performing in extreme conditions leads to great developments in all kinds of equipment, not just motor vehicles. The competition for the evening was Military Personnel Vehicles, and there was a wide selection of entries. 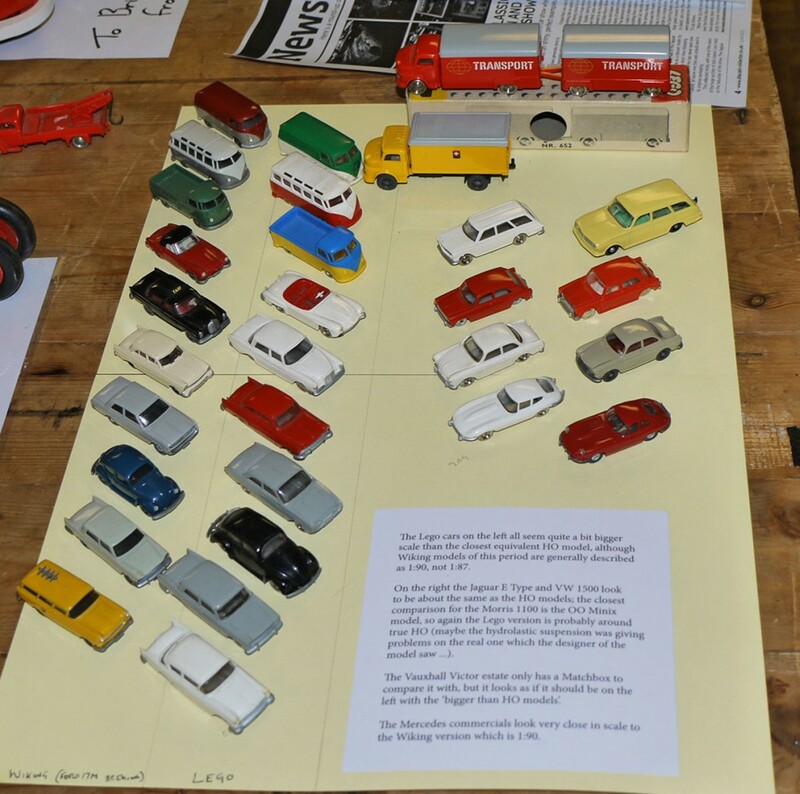 In fourth place, from Hilary Gatward, was a selection including a tinplate Dibro army staff car, a Citroen half-track, and an armoured car from the Sentry Box range. Third was an unusual large tank from Bob Westerbeke based on a design from the USSR. Second place went to Robert Newson for a display of Jeeps, all made in North London (probably) and all different. 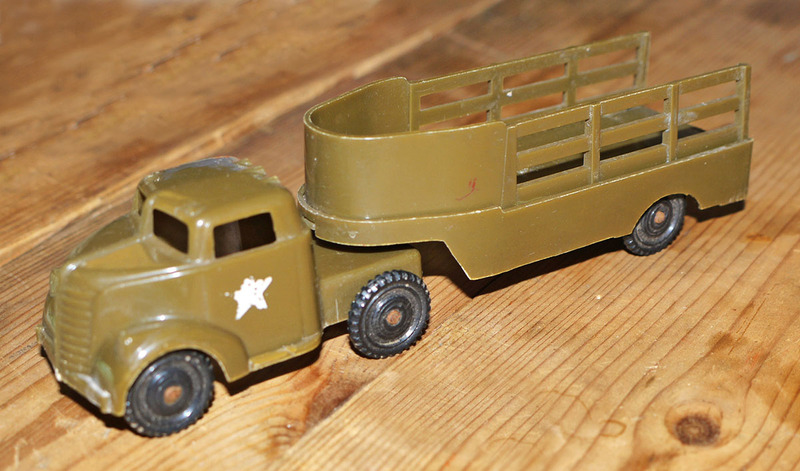 In the early post-Second World War years the sight of US Army Jeeps would have been common on the roads throughout Europe, so the number of toys based on this vehicle can be easily understood. First prize went to Brian Gatward’s display of two Israeli models and a Volvo TP-21 UN car. The Sabra/Gamda Koor range was developed for export, primarily to the US market but was also sold with domestic Israeli liveries. This pair of IDF cars would originally have had Magen David (Star of David) stickers on the roofs. In September Graham Bilbe followed up his previous talk on trolleybuses with a presentation on trams. He covered the history of tramways, and mentioned the first British system in Birkenhead which had rails laid on top of the road surface – a trip hazard for sure! Of course, ‘health & safety’ had not been dreamed up in those days. The rails were originally a means of allowing the horse to pull a far greater weight, not to mention the improved ride quality given the rough road surfaces of the day. With a wide selection of models on display, Graham showed the variety available from around the world, although horse and steam trams are relatively poorly represented in model form. Many tramway systems are now tourist attractions in their own right and have spawned souvenir representations, several of which were on show. Having included trams with trolleybuses in the competition on the occasion of Graham’s earlier talk, the theme for the evening this time was horse-drawn passenger vehicles. 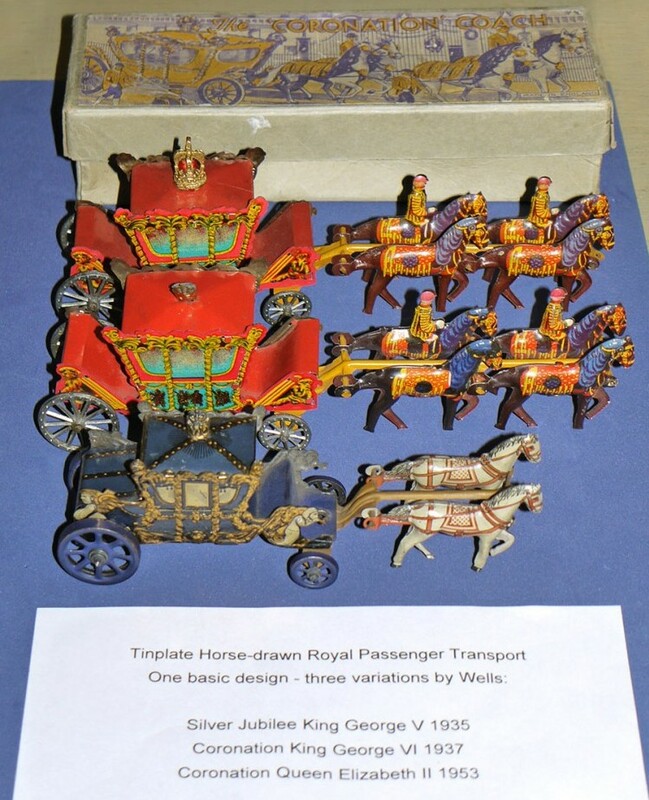 In first place was a Royal selection from Hilary Gatward comprising three Wells tinplate coach variations commemorating the Silver Jubilee of George V in 1935, the Coronation of George VI in 1937 and the Coronation of Elizabeth II in 1953 – she, it seems, was cut back to two horses at least as Wells saw it! 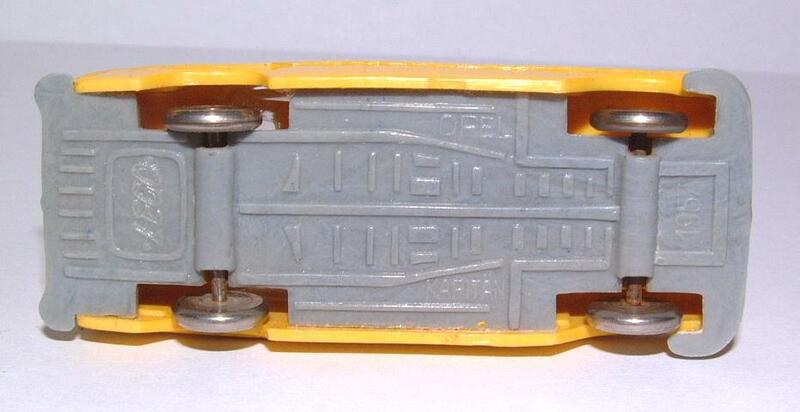 Second was John Garside’s pair of Lord Mayor’s Coaches by Teeny Toy, with and without clockwork. 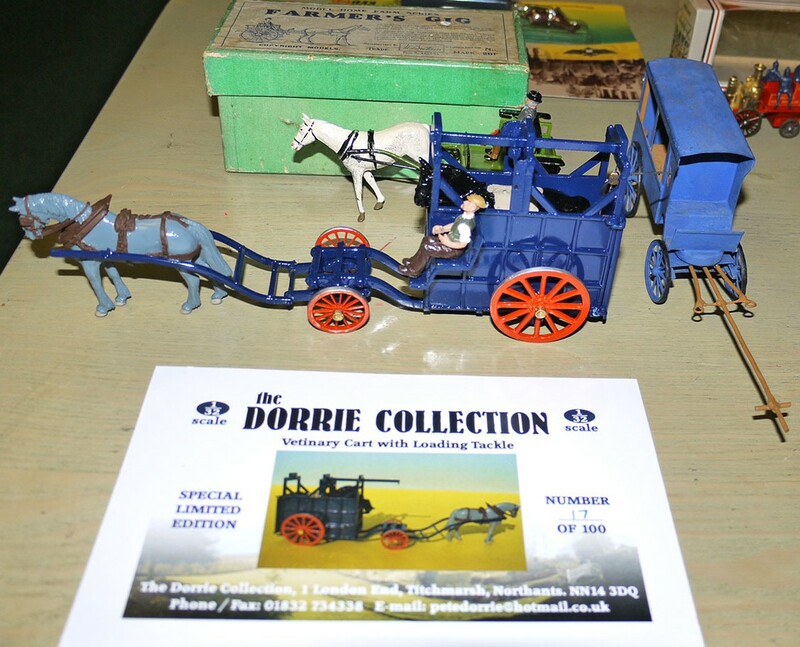 In third place was a selection entered by Mike and Mary Boyd Camps comprising a Dorrie Collection Vetinary (sic) Cart, a Britains Farmer’s gig and another veterinary cart (scratch built). Fourth was the only winning entry the original of which would have been available to the proletariat as a means of transport. 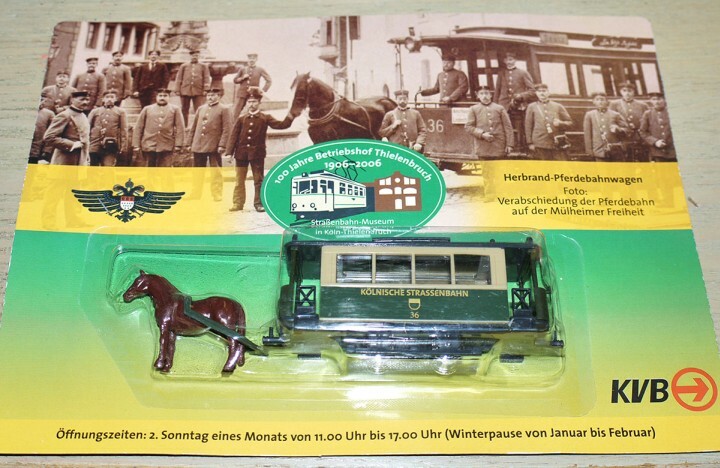 It was Brian Gatward’s horse-drawn Köln (Cologne) tram. The packaging of this model marks 100 years of the tram depot in Thielenbruch on the outskirts of the city, now the site of the tram museum. Although this is well worth a visit the opening days are very limited: the second Sunday of the month from 11am to 5pm except when there is ‘uary’ in the month! August clubnight was the occasion of the annual Fish and Chip supper, and an excuse for general socialising. We were pleased to welcome new members Mike and Mary Boyd Camps, who were club members many years ago. They took fourth place in the competition, on the theme of ‘Ship and Boat Models’, with a collection of Micromodels card kits. In third place was John Garside’s Crescent HMS Eagle, displayed on the Eagle Book of Cutaways. Second prize went to Bob Collins for a display of pre-Second World War Dinky ships - plus a couple of flying boats! In first place was a Timpo Battle Fleet entered by Robert Newson. 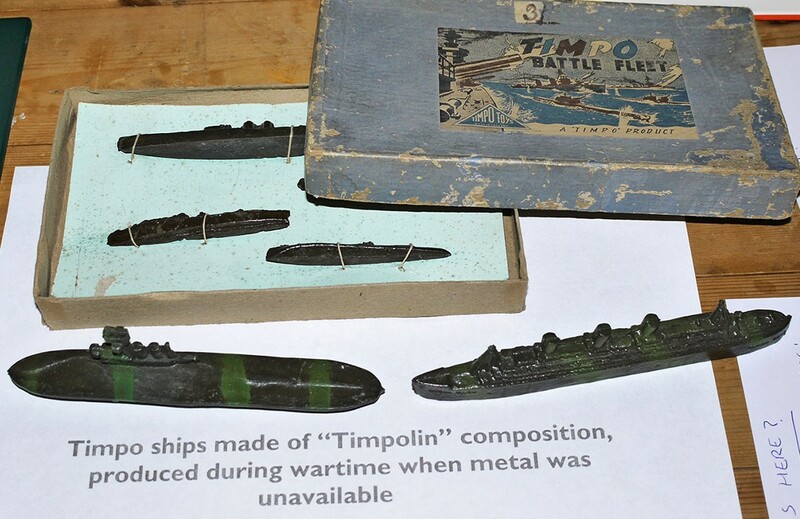 These ships were made of ‘Timpolin’ composition, instead of metal which was in short supply in wartime. 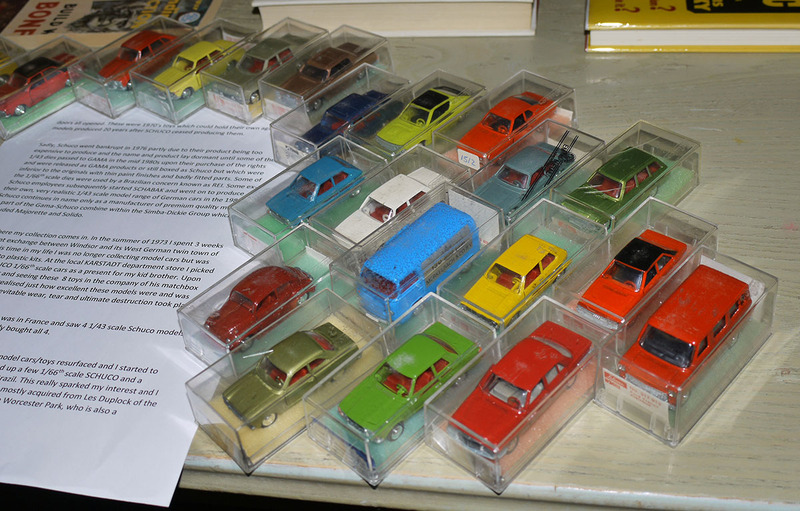 In July we had a members’ display evening – a chance to show an aspect of our collections whether model-related or not. 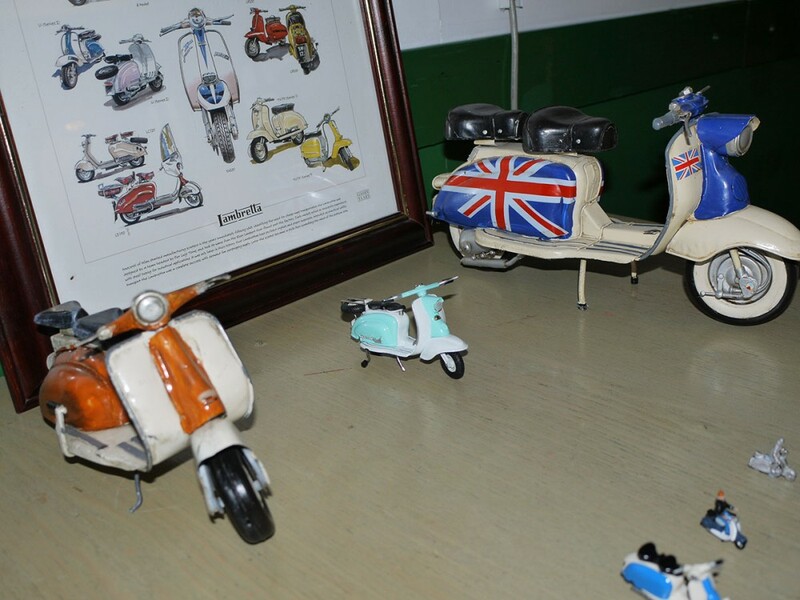 Subjects on display included early British diecasts, the Schuco 1:66 diecast range from the 1970s, scooters, and a collection of artefacts relating to the 1958 World Fair in Brussels. 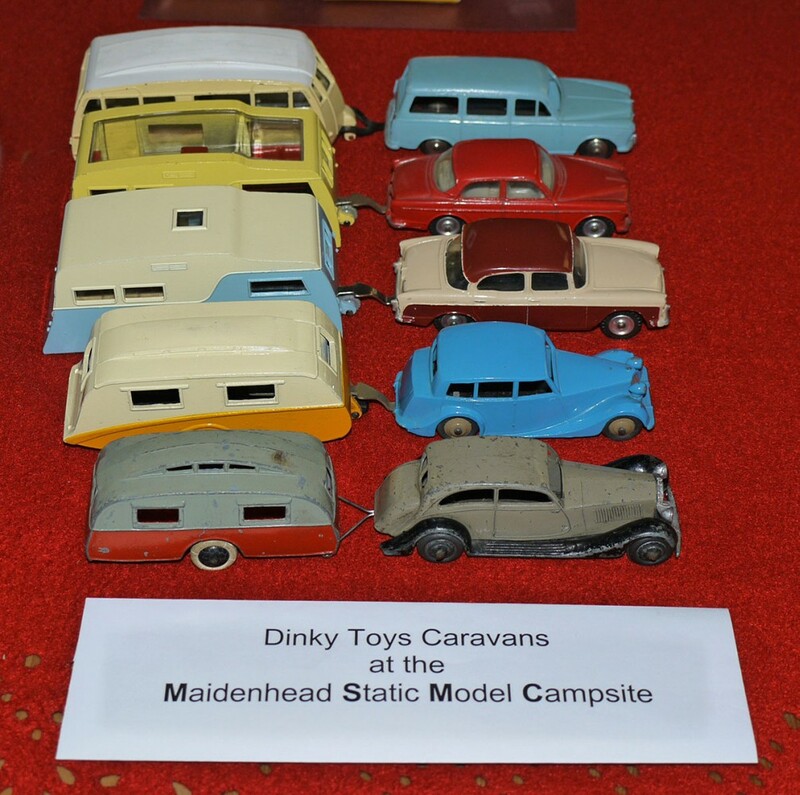 Reflecting the holiday season, the competition was ‘Caravan and Camper Van Models’, but all four placed entries comprised car and caravan combinations. In fourth place from Michael Driver was a display of five Dinky cars and caravans from different eras, one combination being French Dinky. Third was a Kemlows Fleetmaster saloon and caravan from 1948. This has been restored in authentic colours by Paul Brookes – author of ‘The Illustrated Kemlows Story’. This was entered by Hilary Gatward. Second prize went to Brian Gatward for a Laurie Toys (Hong Kong) Volvo 121 and ‘Continental Caravan with Balcony’. 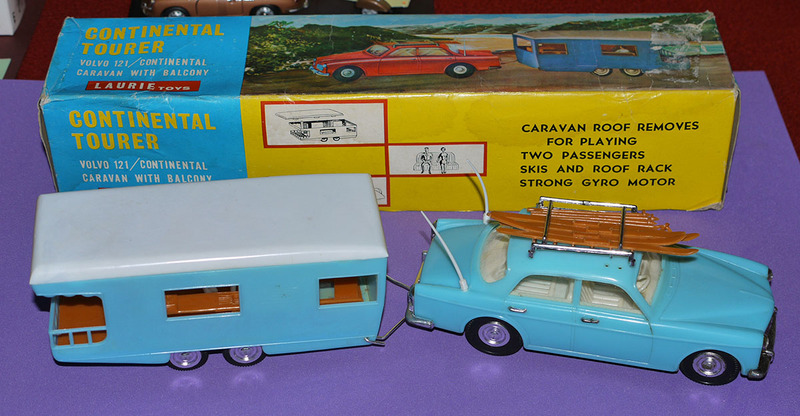 The caravan is a larger copy of the Matchbox model. 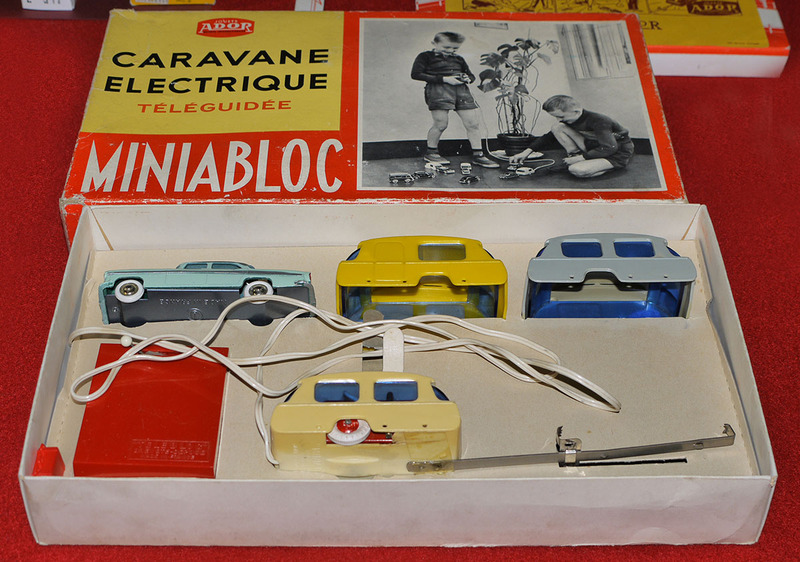 Overall winner was John Garside’s Miniabloc ‘Caravane Electrique’ set with three colours of caravan bodies and a CIJ car. Bakelite was the theme for the June clubnight, with Neil Baldry illustrating his talk with a wide selection of items from his own collection which he produced one-by-one in the style of a magician! The material seems to have been used to manufacture a vast selection of household and everyday objects, and Neil told us of the problems encountered in the 1930s as manufacturers tried to break away from the common brown colouring. It was, of course, the Ranlite and Codeg cars which created the greatest interest for members present, although some bizarre objects like the electric bed warmers, one in the shape of a hot water bottle were also admired. 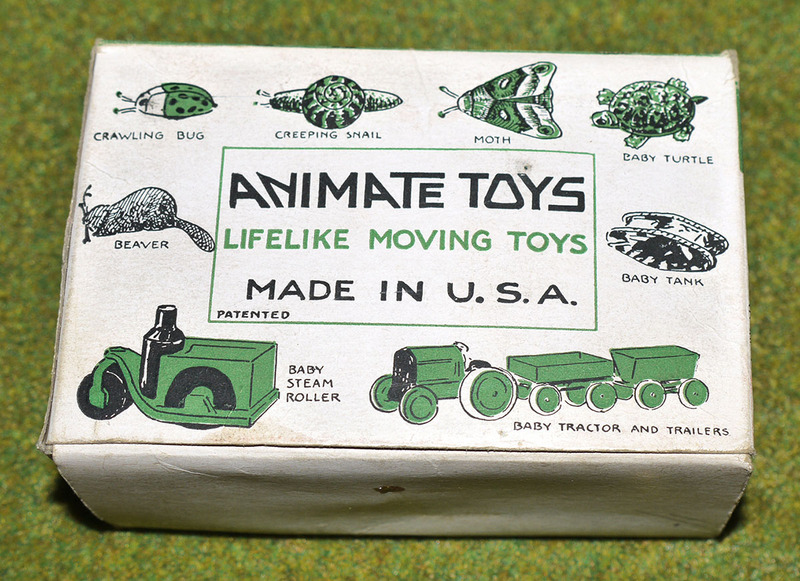 The competition featured pre-1960 plastic toys and some interesting items had been uncovered by those who entered. 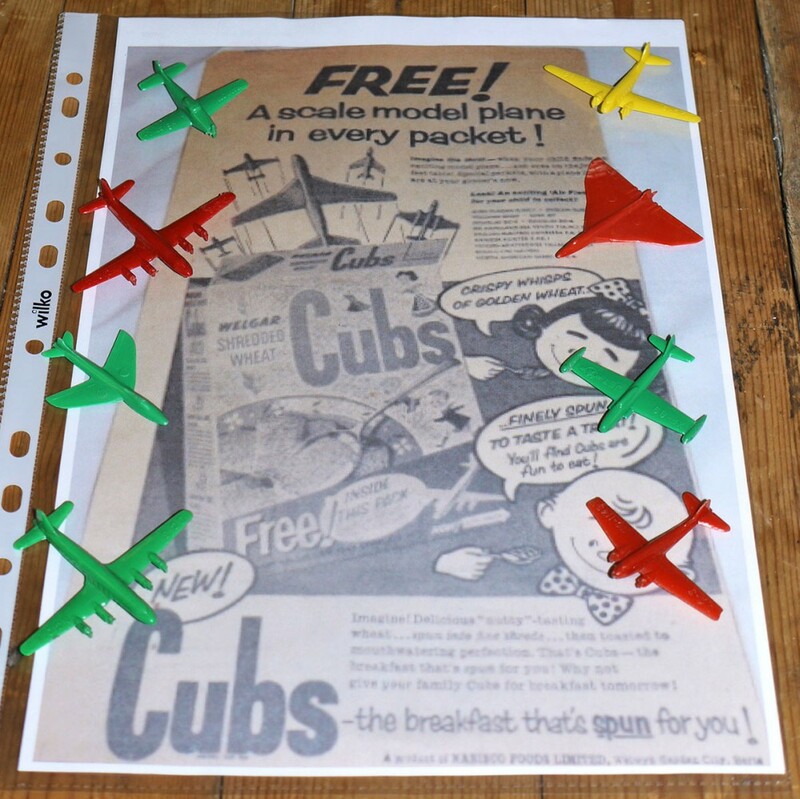 Fourth prize was awarded to Hilary Gatward for a selection of ‘Cubs’ aircraft. These were originally given away with Shredded Wheat Cubs breakfast cereal, and the display included an advertisement for the promotion. 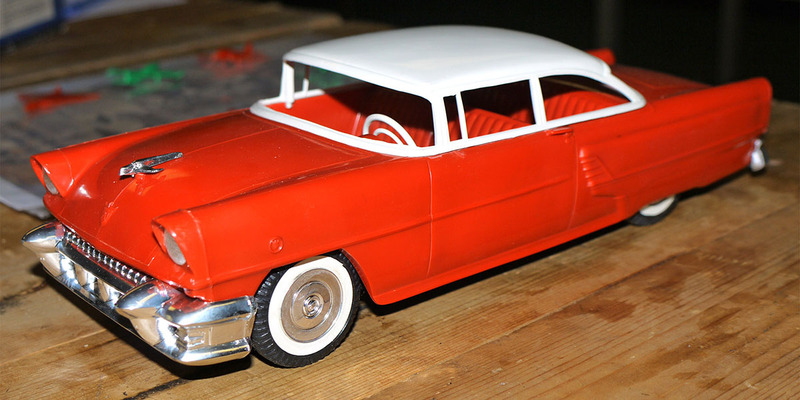 In third place was a Mercury coupé by Osul of Portugal – a company which later produced the Metosul diecast range. This was entered by Stuart Morton. 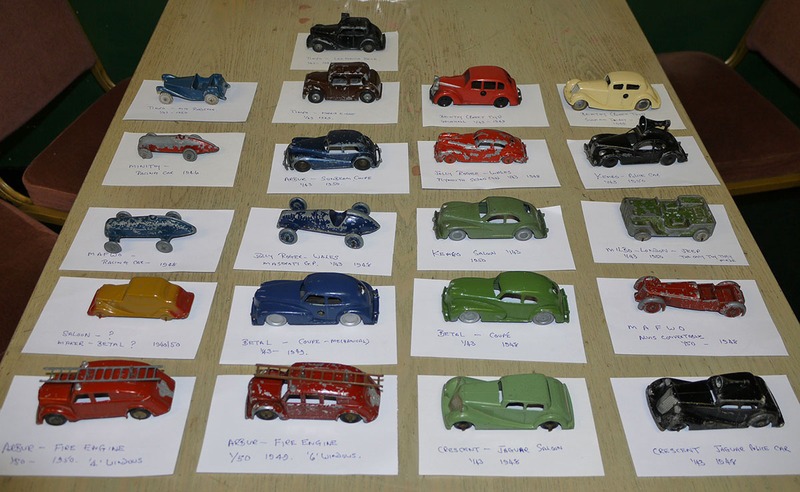 Second prize went to Robert Newson for a display of Betal Austin 16s, with a selection of the variations produced, in both metal and plastic, with clockwork and friction motors. First prize went to Bob Pitkin’s Kleeware articulated army truck made in England. 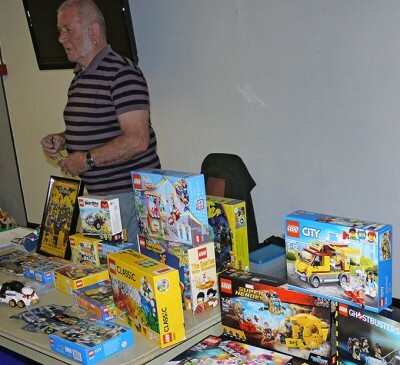 In May Terry Ridgley gave us a colourful presentation about Lego. This included the history of the company which began with wooden products, only starting with plastic after the Second World War. 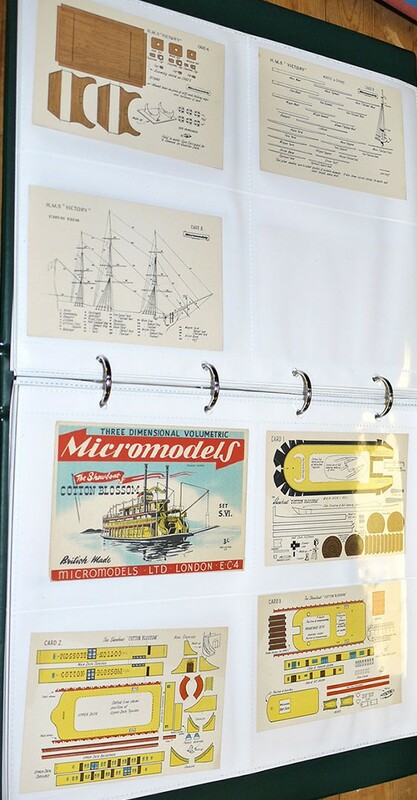 Terry’s display concentrated on later products which mainly comprise kits to produce models to supplied plans. These include many film-related items such as Star Wars and Harry Potter. The Lego figures are another more recent part of the range and are a collecting theme in their own right. 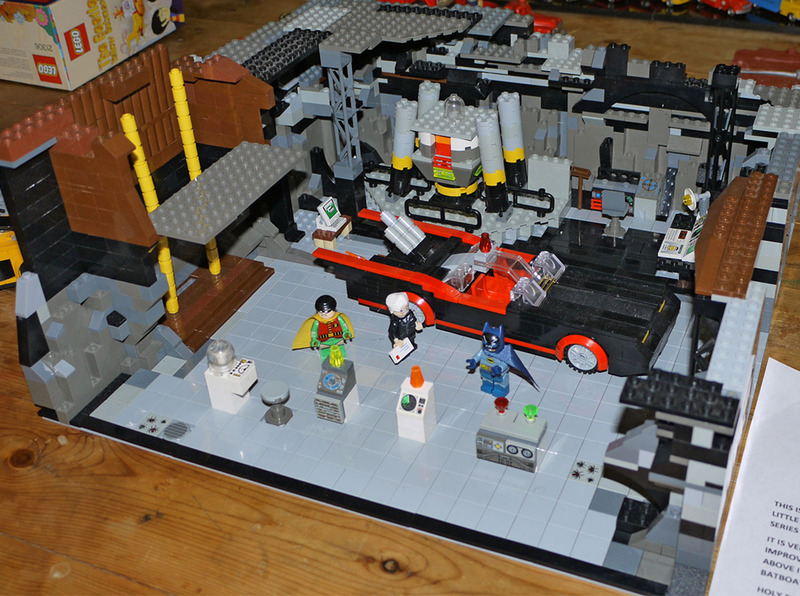 Terry also showed us some of the spin-off products using the style of Lego figures and bricks. Naturally the competition was on the theme of Lego and this a attracted quite a large entry. 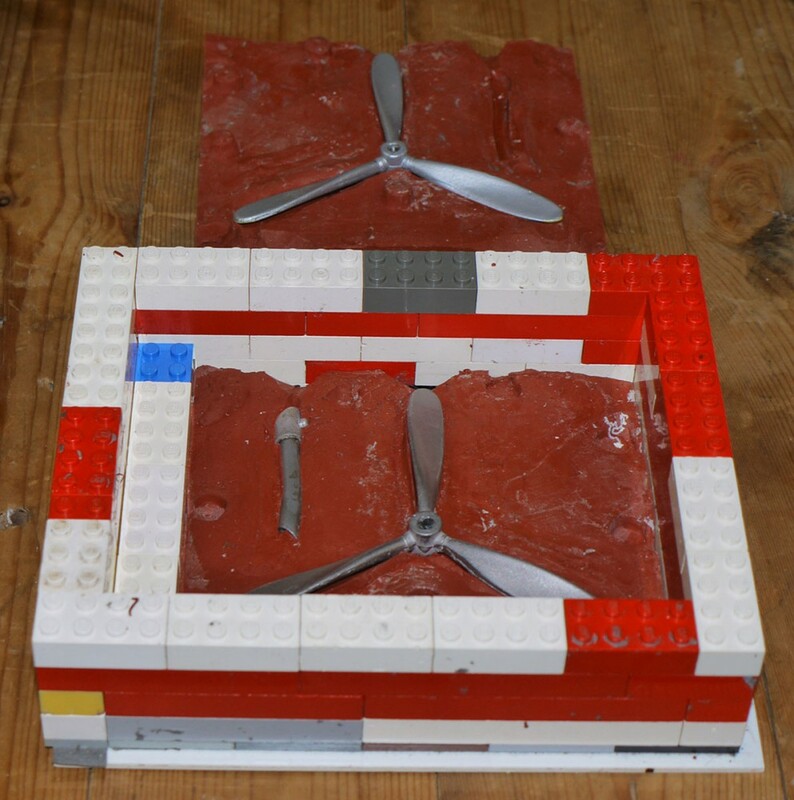 In fourth place was a practical use of Lego as a form for moulding replacement parts – this was from Roger Coles. Third place was a selection of Lego vehicles making a comparison of scales with similar ones in mainly 1:87 scale. Many of the Lego cars seem rather larger whereas the VW commercials and a few of the cars are very close to 1:87. This was entered by Adrian Levano. 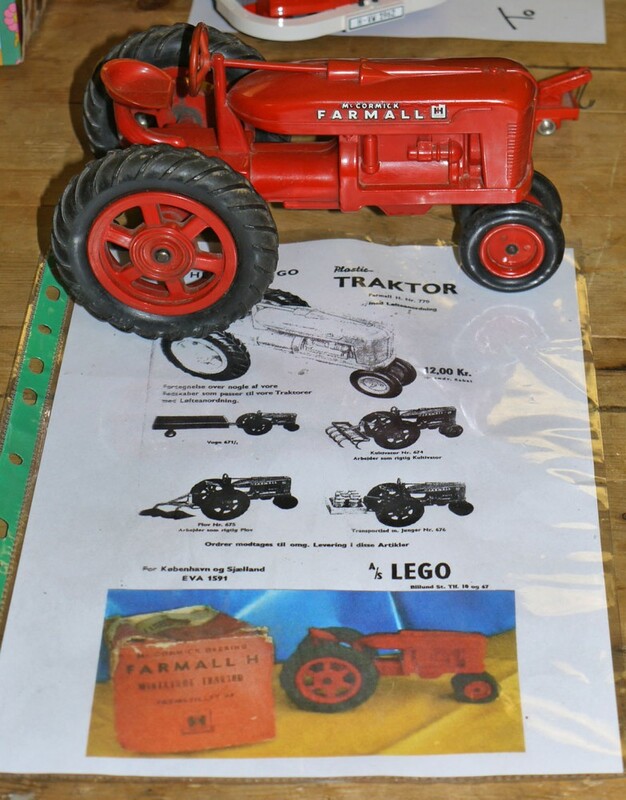 Second (from Paul Rowley) was a larger scale Lego McCormick Farmall tractor, with a Bat Cave diorama from David Arnold taking first prize. At the front of Robert Newson's competition entry was a 'very rare' Lego 1957 Opel Kapitan. It was only after some research following the clubnight that Robert discovered just how rare it is, and how valuable. 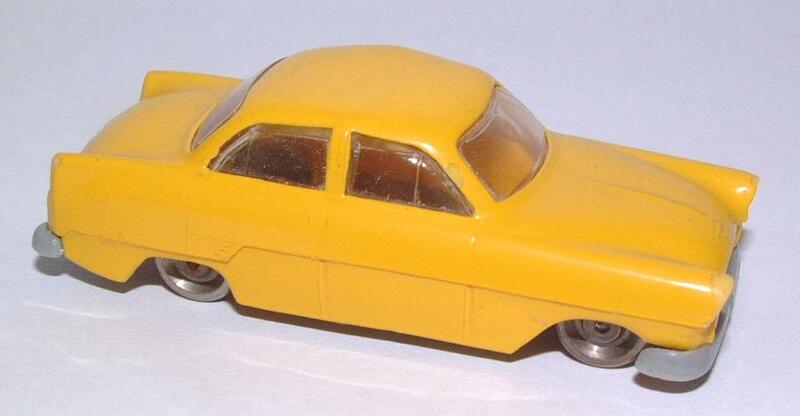 Robert says: 'It turns out that the Opel Kapitan was a trial run model made in Norway - even scarcer than I thought - and it seems likely it's the most valuable piece in my collection! I bought it at the Beaulieu Autojumble in the 1990s, so the Norwegian connection was a complete surprise.' 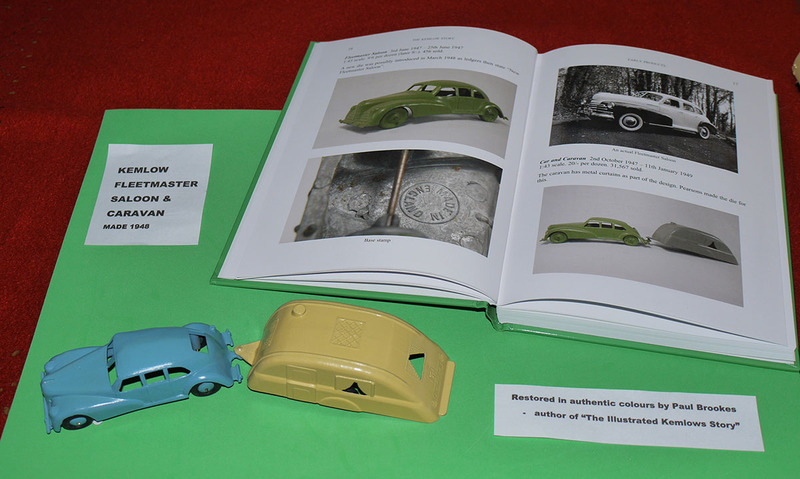 The source of the information about the model gives it a value of around £4,000! The March clubnight was occupied with the business of the club's Annual General Meeting, but we also has the annual Kit, Chop and Restoration competition. 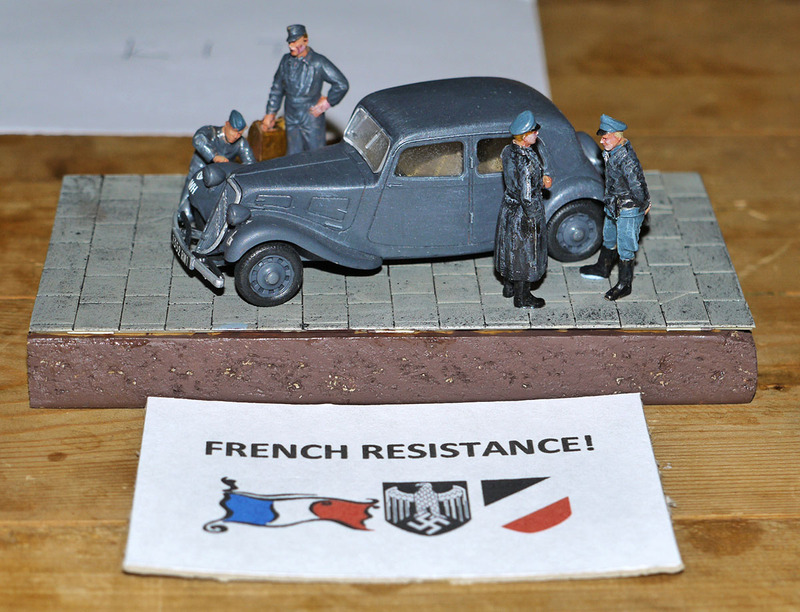 The ‘Kit’ winner from David Arnold was entitled ‘French Resistance’, consisting of a Citroen Traction Avant and some German military personnel. We assume that the Citroen is putting up the resistance, having broken down. 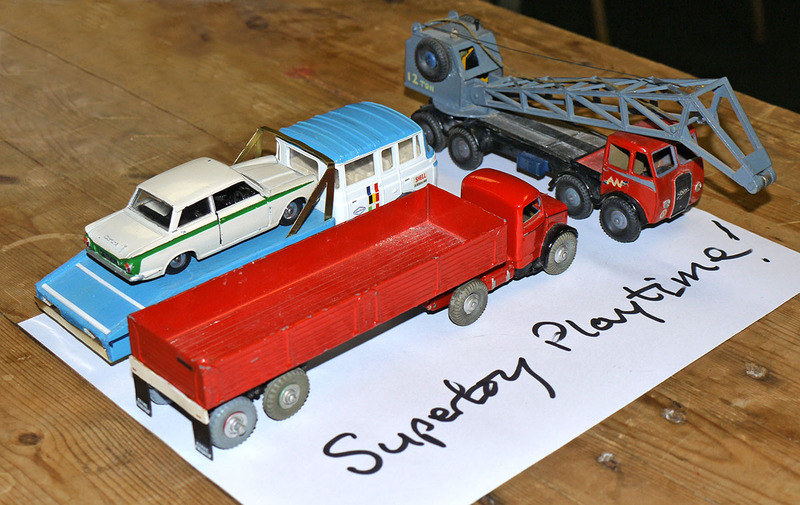 The ‘Chop’ winner (and therefore winner of the Harry Gunner Trophy) was Adrian Mitchell, with an entry called ‘Supertoy Playtime!’. This included three Dinky conversions, one of which was transporting a Dinky Mk1 Cortina painted in the colours of the Lotus version. The ‘Restoration’ winner was Mike Forbes for three more Dinkies, this time Bedford S vans, two Heinz ‘varieties’ and one Golden Shred. In February we welcomed John Coke, who entertained us with a slide show. The evening was in two parts, the first being about the activities and projects undertaken by the Slough and Windsor Railway Society, including the history and preservation of the Slough Estates Ltd. locomotives, which operated on the Slough Trading Estate. 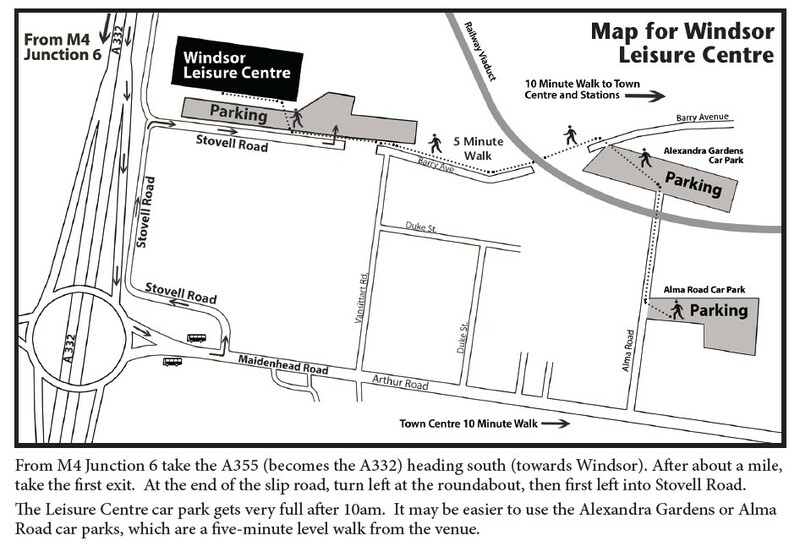 More information about the Slough and Windsor Railway Society can be found at http://www.swrs.co.uk/swrsweb/index.html . The second part of his presentation ranged over a wide range of local (and some not quite so local) subjects bringing back many memories of lost infrastructure. Notable for the contrast with today's climate of security were the years when visitors were encouraged at Heathrow, with viewing and special events on the roof terraces. The evening’s competition was ‘Airport-related Vehicles’ (inspired by the proximity of Heathrow). 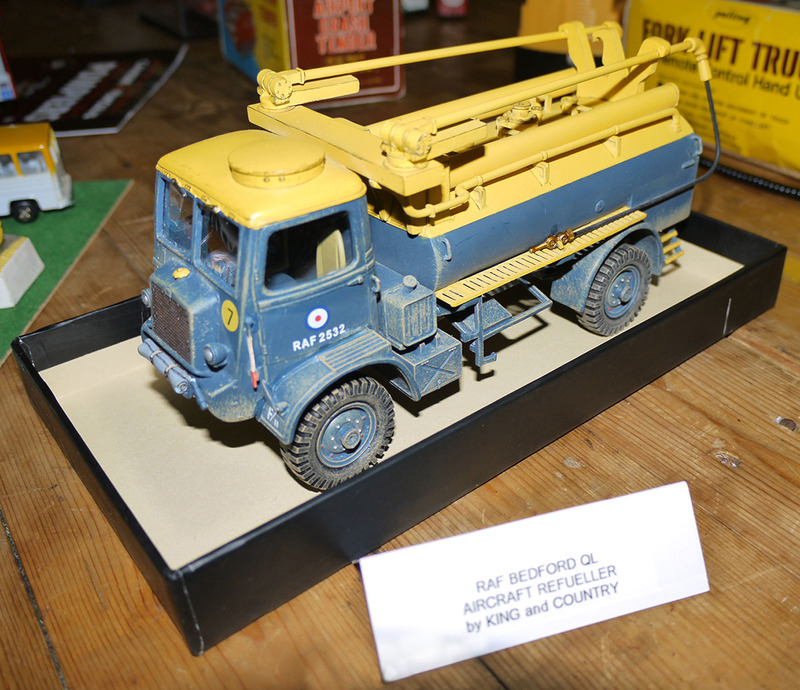 First prize went to Roger Coles for a King & Country RAF Bedford QL Aircraft Refueller. Second prize went to a collection of three refuelling bowsers from Clive Gehle. 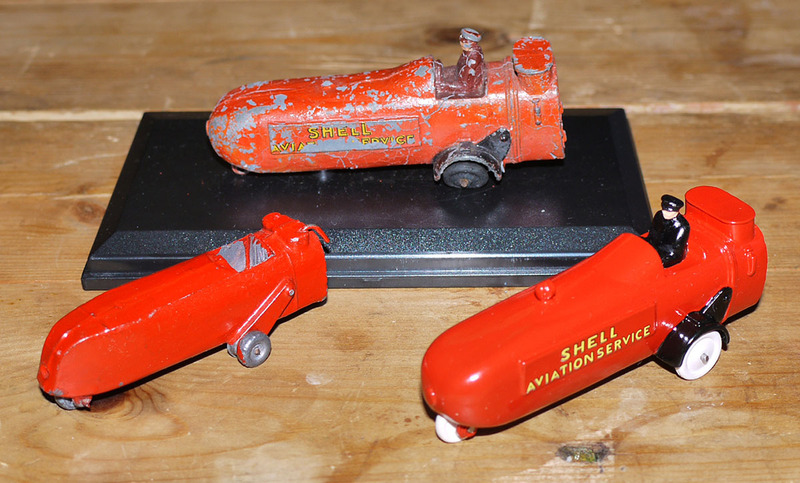 These included an original Dinky 60Y Thompson with a white metal copy, and also the slightly smaller Skybird version. 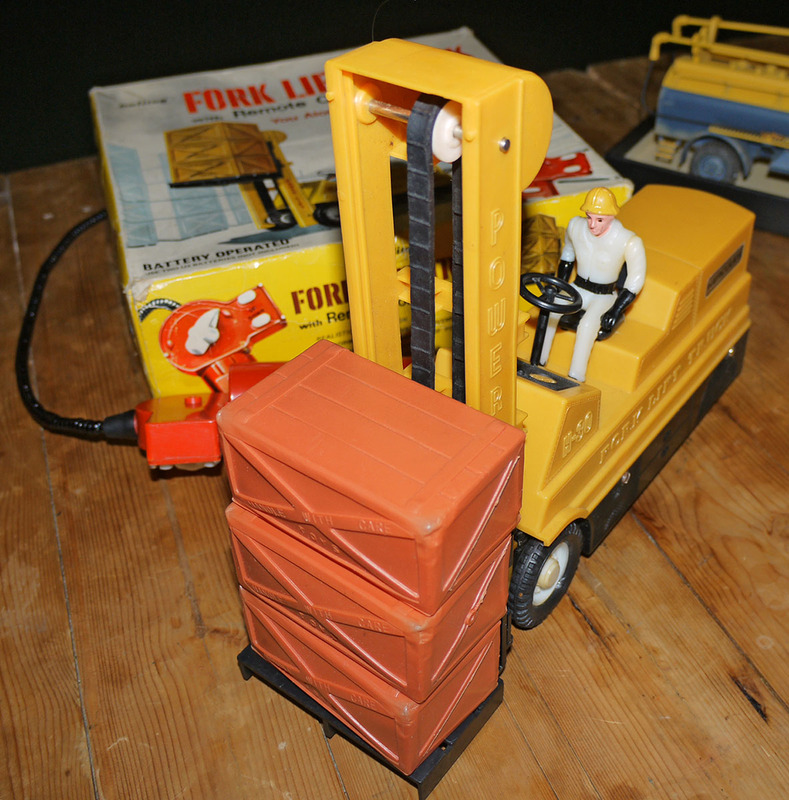 Third was a remote control Palitoy plastic fork lift truck belonging to Bob Collins. 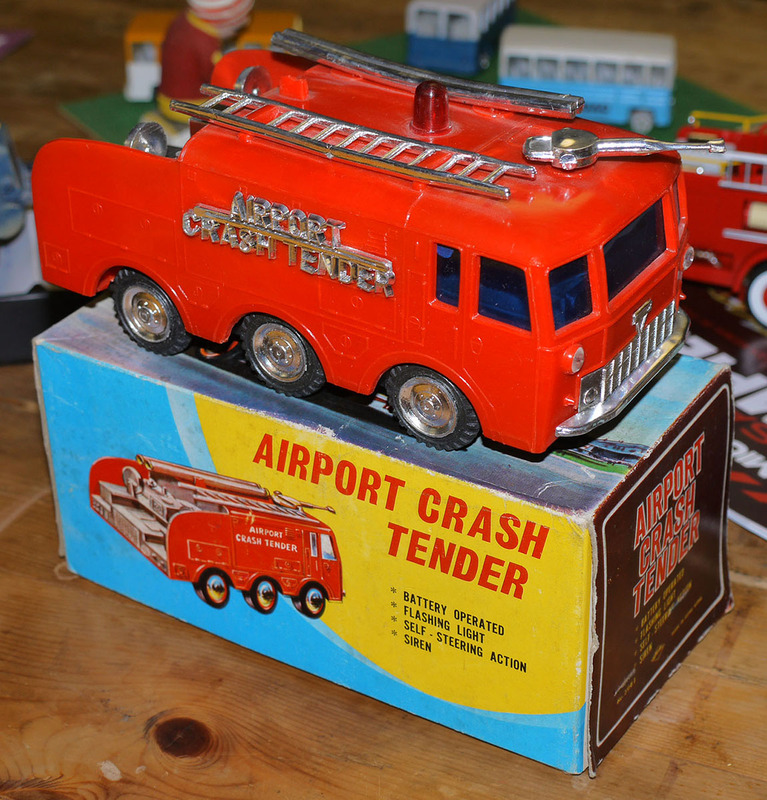 In fourth place was a Hong Kong plastic ‘Airport Crash Tender’ entered by Michael Driver, a much up-scaled copy of the Matchbox Alvis Salamander ‘Foamite’ model. On 21st January the club held the 139th "Windsor" Toy Fair. This was the final event at the Montem Centre in Slough, which has been the fair's home for exactly 40 years, since January 1977. From June 2017 we are moving to a new venue - the Windsor Leisure Centre - so the "Windsor" Toy Fair will at last be back in Windsor! Click here for details of the Toy Fair and click here for a map showing the new venue. At the January clubnight we enjoyed a very entertaining presentation of old transport films given by Frank Banfield. These included a film about London’s last trams, in black and white, showing some footage of the trams' heyday followed by their final destruction after retirement. Then came a colour film of BRS trucks supplying cement for the construction of a dam in Scotland – interesting as much for the lifestyle of the drivers as for the vehicles involved. We also saw Pickfords negotiating the Slough area with a heavy haulage delivery, and as a complete contrast an amusing American short film featuring the family breakdown caused by a man’s obsession with toy trains. The evening finished with a cinema trailer for Flash Gordon, with some of the least convincing special effects ever seen! During the break we had a presentation about the Alexander Devine Children’s Hospice given by founder Fiona Devine and Neil Shuttleworth of SAS Auctions who is a supporter of the cause. The charity hopes to be the recipient of a donation from the club’s charity fund. When completed the hospice aims to provide a much-needed facility for parents and children. The evening's competition theme was steam road vehicle models. 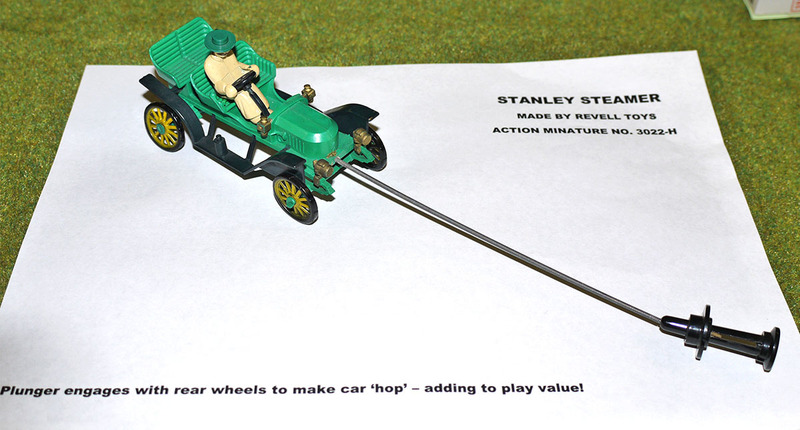 In fourth place was Hilary Gatward’s Stanley Steamer by Revell Toys which, very much a toy, has a jumping action activated by the plunger. 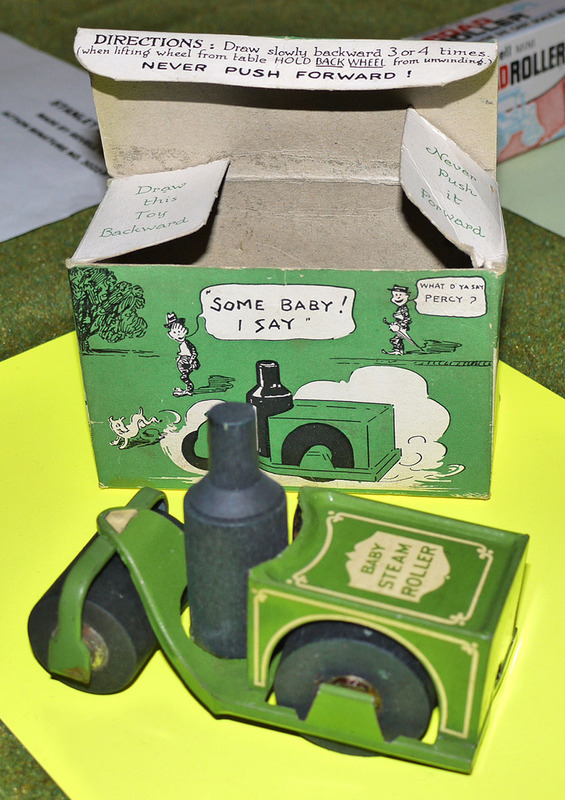 Third was Brian Gatward’s Animate Toy ‘Baby Steam Roller’ made in the USA. 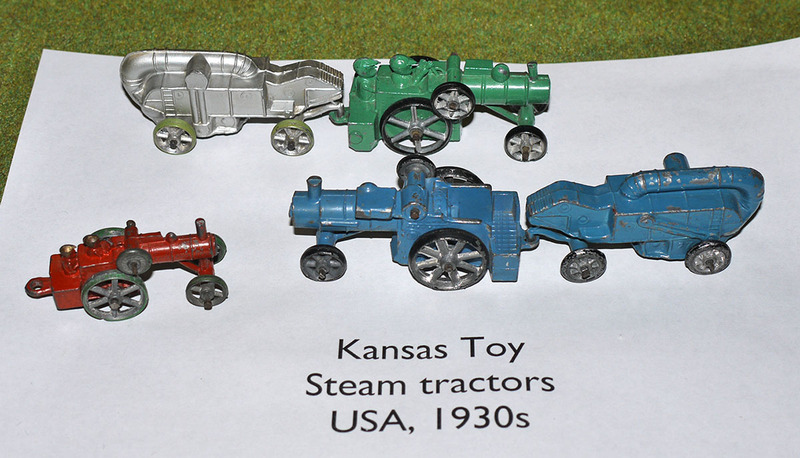 Robert Newson took second prize with a display of Kansas Toy steam tractors and threshing machines, also from the USA and made in the 1930s. 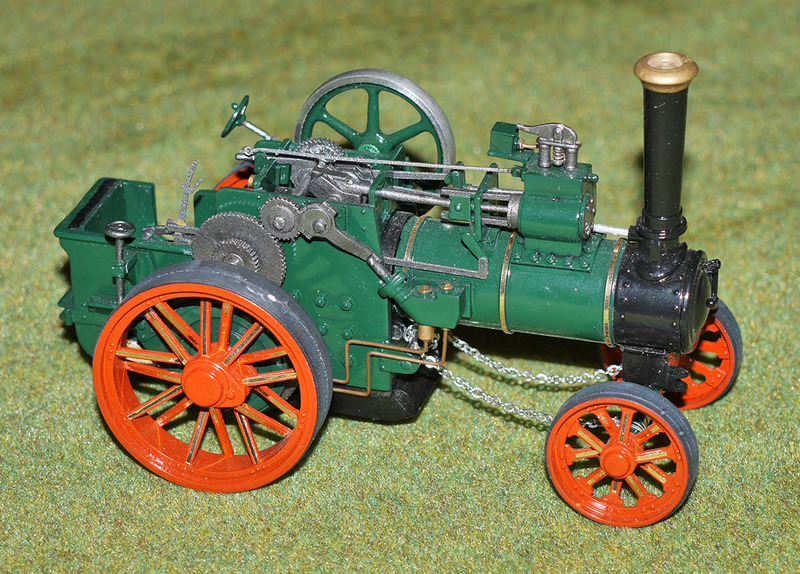 First prize went to Roger Coles for a Bassett-Lowke steam traction engine.